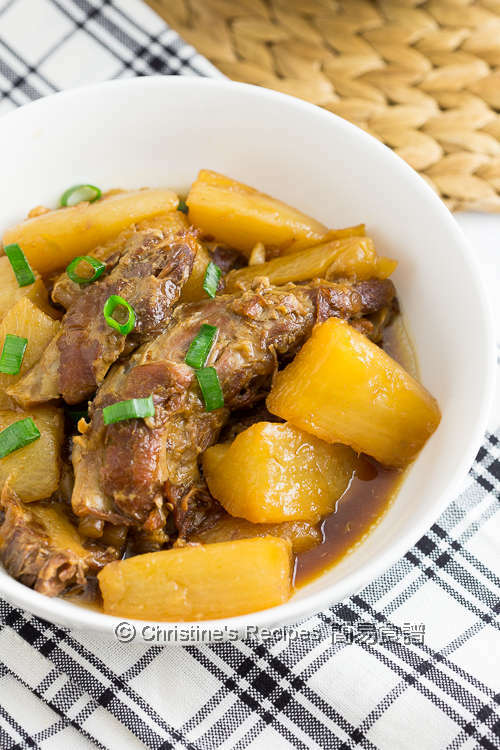 This Japanese pork tender rib stew dish can be served with rice or noodle soup. For those who don’t have an Instant Pot yet, I inserted the stovetop instructions for making this delicious dish. 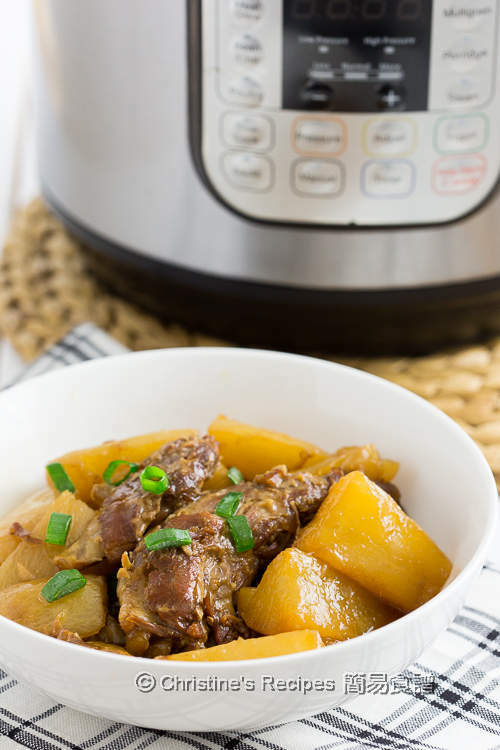 It’s so much fun to explore the functions of my new kitchen toy, Instant Pot. This time my project was to test its “stew” function. The pork tender ribs ( aka 豬軟骨 pork cartilage) from a nearby Asian butcher was only required 35 minutes of pressure cooking. They turned really tender with almost-fell-off-the-bone meat. I had to proceed very carefully in order to pick up the cooked ribs with a pair of chopsticks and filmed it. The radish was a must to add in, taking the whole dish up a level, adding an extra texture. Hope you all enjoy it as much as we did. Blanch the pork ribs. Drain well. Set aside. Use an Instant Pot (See instructions below for stovetop pot), press “Saute” (medium) to heat oil. Brown the pork ribs on both sides in two batches. Return all the pork ribs into the pot. Add in ginger, garlic, soy sauce, mirin, wine, vinegar, rock sugar and water. Cover and turn the steam release handle to the “sealing” position. 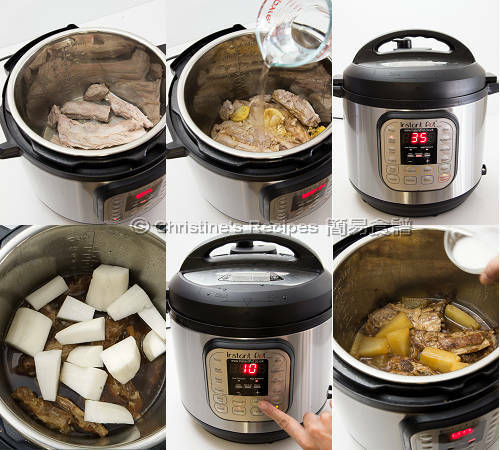 Set “Meat/Stew”, high pressure, for 35 minutes. When the programme finishes, wait 5 minutes, then run quick pressure release carefully. After the float valve drops to the down position, you’ll find the lid can be removed easily. Add in the radish. Cover the lid with “sealing” position again. Press “Meat/Stew” and cook for another 10 minutes. Quickly release the pressure. When the valve drops, remove the lid and press "Sauté" button to reduce the sauce by 1/3. Season with salt. Stir in the thickening and cook to your preferred consistency. Garnish with spring onion. Serve hot. Enjoy! You need to add 2 more cups of water to cook the ribs, following the above steps. When it boils, reduce the stove heat and simmer for 1 ½ hours or until the ribs are softened. Add in the radish at about 20 minutes before seasoning and adding thickening. Before adding in the radish, I used a fat separator to remove the oil on the sauce surface, followed by remaining steps. You might like to use a large spoon instead. By adding rock sugar, the sauce will become glossy and more attractive to dig in. Just in case you're interested in getting an Instant Pot. I got it from Amazon (UK) as the model for sale in UK, with 220 volts, suitable for using in Australia. This is so comforting and delicious, Christine. Mine is 6L (6qt) from UK. They got a bigger size, 8L (8qt) on Amazon US, but not on Amazon Uk at the moment. Check carefully what electric voltage used in your country and see which suits you. Could I do this with a slow cooker instead? This recipe works with a slow cooker too. It'd be very delicious. Hi Christine, do i need to adjust the water if i use slow cooker? Sure, adjust the water if using a slow cooker. And the heat level also affects the results. You'll be good. Thank you for another wonderful recipe Christine. I made this on the stovetop and the flavour was perfect - much enjoyed by the whole family. They even helped themselves to seconds.